2-wire video kit with hands-free CX-MODO video indoor station with 7″ display and MIKRA outdoor station. CX-Modo has image memory and Radio Yokis remote control built-in. Up to 100 pictures can be saved and 8 Yokis modules can be managed. By Yokis is possible to activate 8 services like: to switch on-off the stair lights, UP and Down shutters. 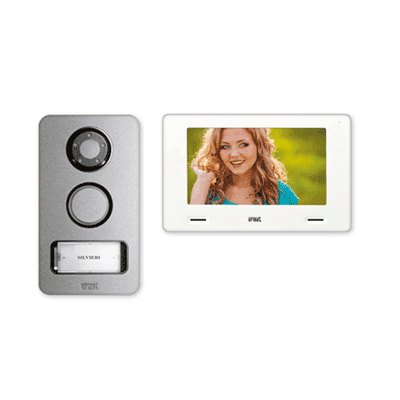 The monitor can intercom with other video door phones- Up to 4 indoor stations in parallel can be connected. ORTIis a private company that was established in 1980. It has been the agent of the Italian company. URMET in Egypt since 1984. We have been selling and installing . URMET’s Intercom systems and also offering customers after-sale service for more than 35 years. In 2011, ORTI has become an agent for the Italian company Euromatic for Automated Gate Systems in Egypt. We supply and install systems to automate all kinds of garage doors.